In this puzzle game you will learn that Snail Bob did not have such a fun time when all the technology started to expand, as it destroyed his natural home and his whole lifestyle. Luckily he is a very adaptable snail so he learned quickly how to manipulate the machines, but still, he needs your help greatly if he wants to find a new home. Help him get through all the pipes on each level and try to do this as fast you can because the more time passes by the lesser your score will be. Click on him to make him stop and handle all the switches to make the environment work for him so he can reach a new and comfortable home. There will be lots of dangers but if you are in the clear and he moves too slow, you can speed the game up so you wont have to wait. 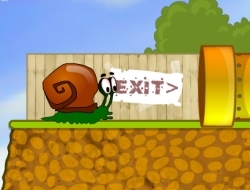 Use the mouse to clear the path for Snail Bob. Snail Bob 0.00 between 0 and 10 based on 0 votes.